IoT Infrastructure Market size was valued at over USD 15 billion in 2016 and will grow at more than 25% CAGR estimation from 2017 to 2024. Rising investments in smart city projects across the globe is anticipated to drive the IoT infrastructure market growth. Smart cities offer a wide range of connectivity and computing options that can be implemented to the existing setup in order to optimize the efficiency. Challenges within city transportation, energy management and infrastructure are addressed with the use of such technologies. Implementation of IoT solutions in cities allows them to make use of the technology and data to improvise the infrastructure as well as services. Increasing demand for efficient utilization of resources across the urban areas further escalates the industry adoption. Privacy & security concerns related to these IoT network connections is predicted to restrain the market growth. Cyber-attacks can eliminate the efficiency gains and unguarded networks will make the smart cities, buildings and homes vulnerable to potential security threats. Also, lack of laws & regulations governing smart cities might pose a challenge to growth. Increasing need for proper management of the vast IoT network in a smart city which include transportation, infrastructure & energy management is expected to boost the demand for network management platform segment in the IoT infrastructure market. These platforms are capable of providing real-time insights to the communication of smart devices in an IoT network enabling the operators to have control over the network and the devices. Access to the crucial information related to effective utilization of energy sources can be gathered with the implementation of such platforms. 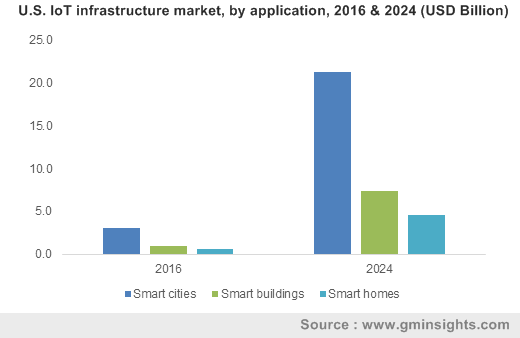 Increasing demand for reliable and dedicated sensors for improving the quality of living in a smart city is expected to boost the demand for sensor technology in IoT infrastructure market. Sensors embedded in the devices allows seamless exchange and transfer of data in a network. These devices produce enormous volume of data which has to be collected and analyzed. Rising demand for requirement of communications technology for connecting these sensors lies huge growth potential for the market. Increasing deployment of connectivity technology solutions such as Wi-Fi, NFC and cellular technologies for knowing customer preference and communication between the devices further contributes to the connectivity technology growth. Heavy investments on hardware components by various government organizations is anticipated to boost the demand for IoT infrastructure market. Increasing penetration of IoT enabled components across various regions further contributes to the strength growth of the hardware segment. The software segment is anticipated to witness high growth owing to the growing demand for software such as data management and streaming analytics. Professional service segment observes a huge demand in the IoT infrastructure market in order to support companies in the business process transformation. The enormous size of the professional services market in the U.S. owing to the presence of large number of commercial establishments offering such services is expected to contribute to the industry growth. Moreover, increasing focus of government in smart initiatives is offering service providers to invest in markets such as India, China, Singapore and Malaysia. Smart building segment is expected to witness substantial growth over the forecast timeframe. This is attributed to the increasing demand for automation in buildings to control operations such as air conditioning, lighting, ventilation and heating systems. Sensors, microcontrollers, actuators and various other technologies are implemented in smart buildings to collect & analyze data in order to streamline the processes. The usage of IoT solutions in buildings are advantageous for business owners owing to the benefits such as enhanced performance & asset reliability, optimized energy use thus reducing the environmental impact on buildings. For instance, MNCs such as IBM, Honeywell, Cisco are implementing such solutions in their office buildings to better respond to company’s energy efficiency policies. Asia Pacific IoT infrastructure market is set to witness significant growth over the forecast timeline. The growth can be attributed to the rising investments in smart city infrastructure by various governments in the region. The smart city initiatives in countries such as India, South Korea and Singapore provides impetus to the growth. Government of India plans to make 100 smart cities with a proposed investment of multi-billion dollars is attracting many investors for a high ROI. The growing trend of urbanization coupled with the increasing demand for efficient utilization of energy sources across many European countries such as U.K, Germany is expected to fuel the demand for IoT infrastructure industry. Industry participants in the IoT infrastructure market include IBM Corporation, Intel Corporation, Microsoft Corporation, Schneider Electric, Huawei Technologies Inc. Other prominent players include Accenture PLC, PTC Inc., Honeywell International Inc, Oracle Corporation and SAP SE. It is a fragmented industry with the entry of new players coming with sophisticated technologies and innovative solutions. The industry players are increasingly focusing on ensuring the operational excellence in infrastructure project delivery, allowing sustainability through maintenance. Every city across the globe are exploring the extent of using technologies in order to enhance the quality of living. The players operating in the industry are concentrating mainly on development of advanced solutions to meet the customer demand. With the depleting energy resources across the globe, increasing demand to manage the resources efficiently is attracting the industry players to invest more in R&D to develop such technologies. Growing need to sustain improvised services for businesses as well as citizens while enhancing the efficiency is creating significant opportunities for industry players. Furthermore, companies are focusing are providing a range of governance, management and infrastructure solutions to address citywide operations as well as individual needs.